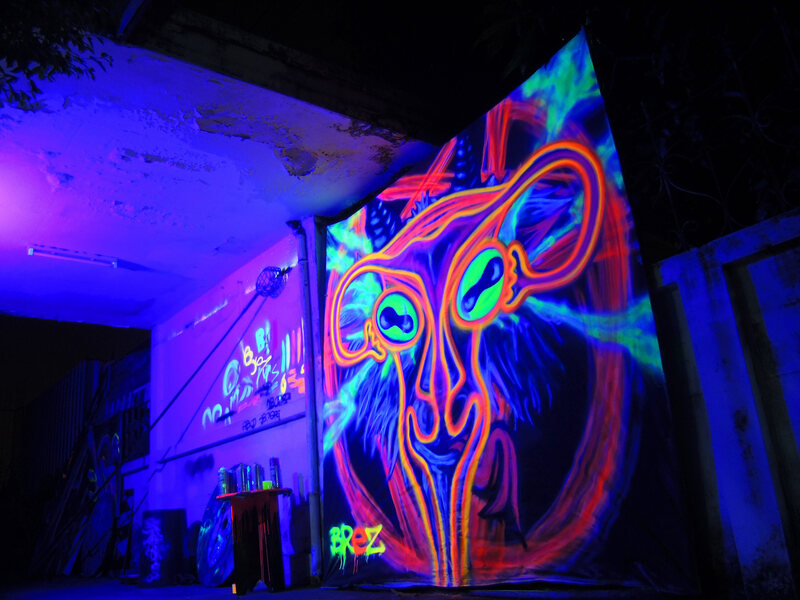 Once again connecting random mental dots and realizing them through the power of art 😉 – black light graffiti art piece depicting the Church of Satan logo (a goat’s head imposed on a inverted pentagram also known as the ‘Sigil of Baphomet’) with a slightly altered and interpreted medical illustration of a glowing orange uterus layered on top painted using UV reactive spray paint. 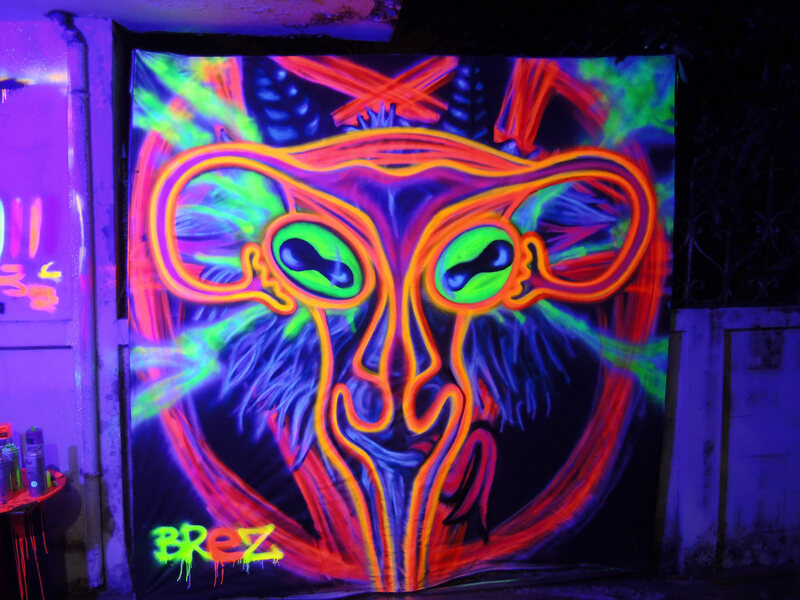 2m x 2m painted for a client on a portable canvas ready to raise hell at a rave near you soon (presumably). So pretty much everyone recognizes this logo as the Satanic Goat on “devil worshiper star” (not my words but I guarantee you that’s what most people will say – it’s even funnier when they mistake the pentagram for the Star of David…). To be precise this combination of star and goat head is in actual fact a registered trademark by the Church of Satan (please don’t sue or hex me guys, cheers). 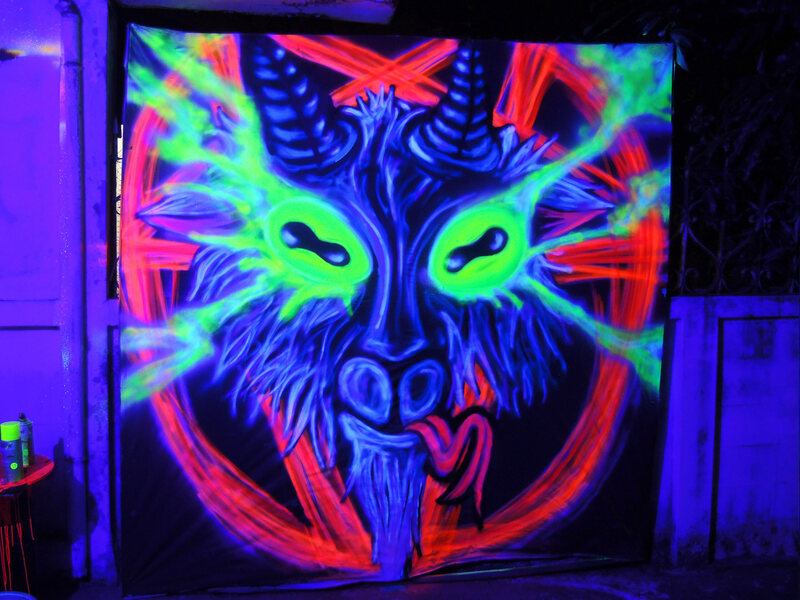 The ‘Sigil of Baphomet’ as it’s termed is a pretty mean looking logo, a devious looking goat backed onto an inverted star (the pentagram is also associated with Wiccan/Wicca practice). 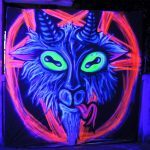 It goes without saying that it’s full of various meanings and associations that pack a lot of weight… All that aside, I really like the aesthetics of this logo (i also really like all things occult and goats), so I thought I’d give it a go painting it in black light spray paint. 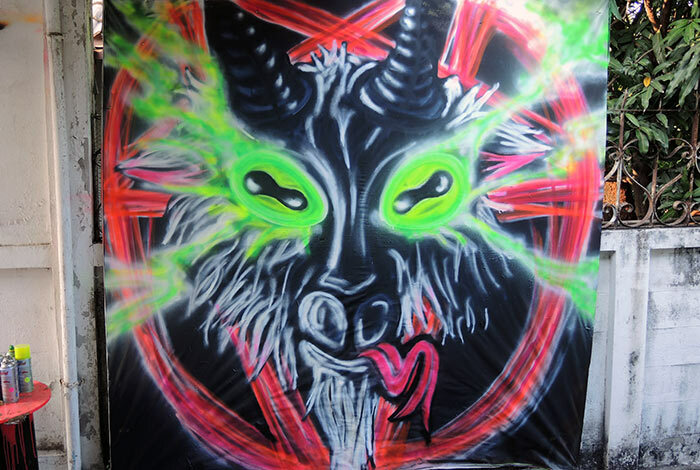 The photo above shows the first phase of completion, the pentagram itself is painting in a scratchy edgy fashion using a pink and a darker red black light reactive spray paint, the eyes are mostly green and I’ve added a snake forked tongue for that extra edge. The above stage (phase 2) I’m not so sure about, i think i overdid it with the green glow on the eyes. The colour palette when it comes to making black light art is rather limited however what i do like is that it strongly remind me of one of my favourite comic book art characters namely, ‘Spawn’ (created and written by Todd McFarlane) – the comic in it’s own right is a heavily satanic peppered story line an epic battle of heaven and hell, if you don’t know what I’m talking about Google that sh!t, it’s great and the illustrations and character designs are nothing short of epic. 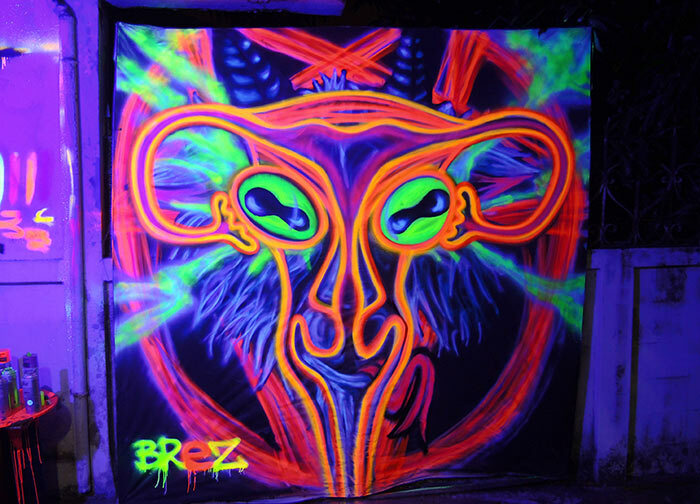 Above photo shows phase 3 – the final phase of the black light art mural. 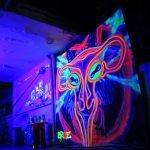 The more i create UV art the more i realise the strength in combining the palette of all UV reactive colours available… I’m rather happy with the result and thing the uv-orange really punches through, also through random particle paint splatter the other layers fade nicely into the background. 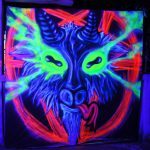 This UV art piece could be described as what happens when a random thought turns into a realization… One day I was randomly googling something to do with satanic imagery and symbology (as you do naturally…) – possibly in preparation to a tattoo design I’m working on. As I was looking at the familiar evil looking goat face I thought to myself, “doesn’t that look awfully similar to something else?” – and so I proceeded to google; “Uterus Goat Pentagram” and naturally other people had connected these very dots together also. 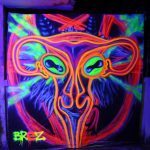 There are some theories out there behind it, but I’m not going to go into that, today I’m focusing on aesthetics without too much thought or meaning going into the piece at hand – hopefully i haven’t unwittingly performed any ritual practice and summoned a number of demons. As aforementioned I’m not too serious about it, however as with all religions there are some good points made by the Church of Satan, just in case you’re wondering at time of writing this, I am not a member nor do i particularly want to join it or any other organized relegion. 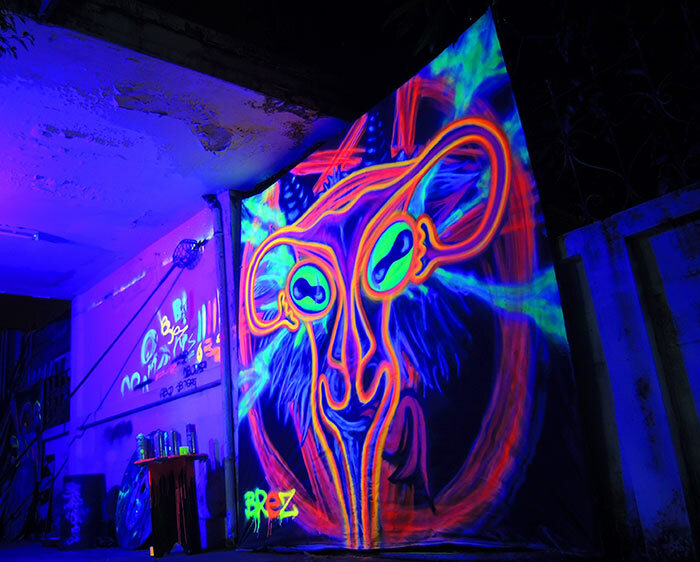 Below photo shows the piece ‘sans-uterus’ in day light, where it looks even more comic book style, a lot of the white scene in UV light is not seen as it was painted using black light reactive white paint which is actually clear and non-visable in normal day light. 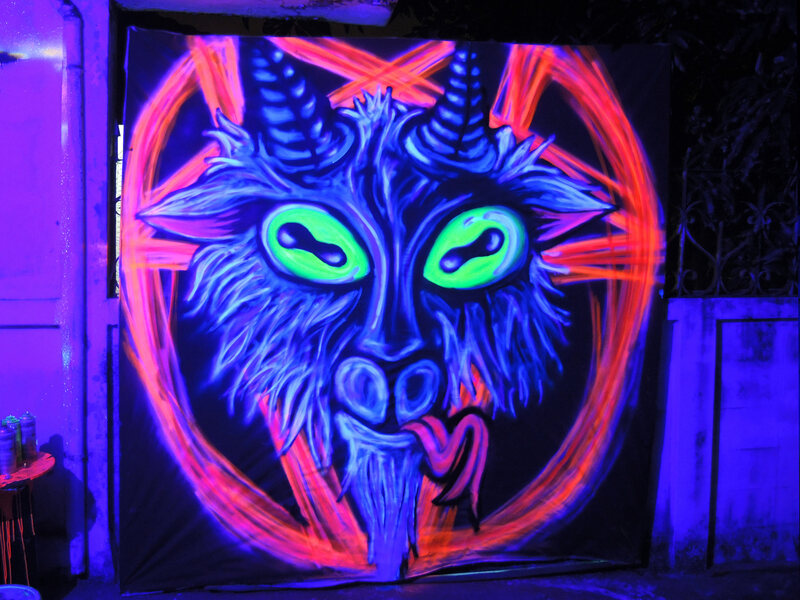 Download Black Light Sigil of Baphomet Graffiti Wallpaper size! So just to keep thing fresh i’m offering you the reader to download the image in high-resolution so you can stick it on your desktop background and invoke some fear in your work colleagues, friends and family. Simply right click the below thumbnails and select “save as link as…” alternatively left click to enlarge the image and then click the downwards arrow to the upper left of the image implying download. Any problems let me know.